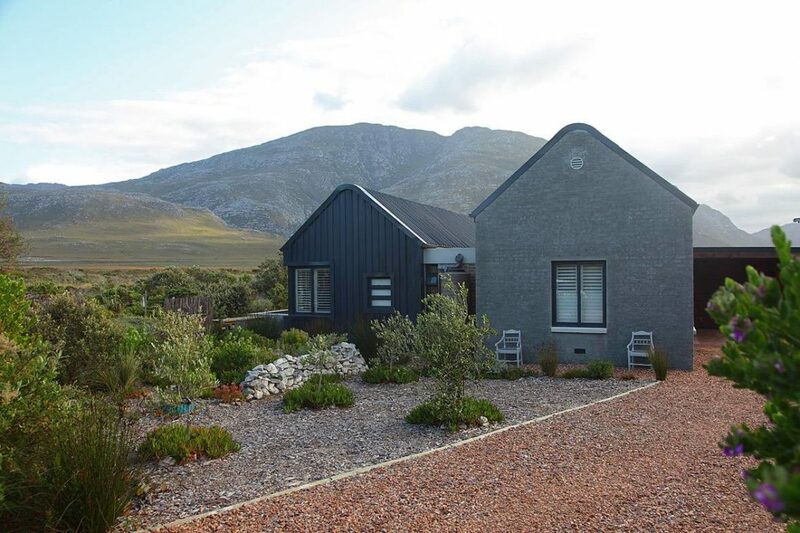 Kindred spirits are attracted to Betty's Bay – perhaps because they feel at home in and with nature – where you will find no fences which divides nature and architecture. Originally published in the Buzz of July 2010 and again on 6 April 2014. Add to this seasonal recreational fishing of West coast lobster (Jasus lalandii) and various line fish such as Silver cob (Argyrosomus inodorus), Geelbek (Atractoscion aequidens), White Steenbras (Lithognathus lithognathus) and migrating West coast Snoek (Thyrsites atun). Our national fish the Galjoen (Dichistius capensis) is the prize on your winter line and in the rock pools Black mussels (Choromytilus meridionalis) and Mediterranean mussel (Mytilus galloprovincialis) can be found. This Garden of Eden seems to attract not only botanists, birders, sun bathers, naturalists but also writers, philosophers, artists, scientists, architects and engineers amongst other. Serious adventurers can choose between kayaking, hang gliding, surfing, wind surfing, dune surfing, rock climbing and diving. Why, I asked myself when I purchased a stand, designed a house and built here seven years ago? What is so special about this place called Betty’s Bay that gets under your skin in a way that stays with you? How could it not when on a clear day Verreaux’s eagles are soaring overhead. How can one forget a place where thirty dolphins swam past you or a two meter long harmless gully shark bumped against your leg in the surf where the Southern Right whale (Eubalaena australis) visits once a year and Grey buck (Raphicerus melanotis) drinks water in your garden. Rare and magical experiences will accumulate if you enter this place with the right intentions and awareness which is simply to respect nature since it is one of very few places in the world which offers us the opportunity to truly appreciate such relatively untouched biodiversity at close range. The region is rich with history and “stoepstories” (tales). Evidence from the early San and Khoekhoe, dating back 100 000 years BP with middens and rock fish traps still visible in the area. During the 1600’s the VOC traded with the Chainogua for sheep and cattle in the region. Hangklip would not be the same without it’s own shipwreck tales of stormy seas and high winds such as the two Dutch ships De Grendel and Ternate which came to their end off Cape Hangklip in 1673 and 1680. On the Sea Farm (Hangklip) side, foundations of dwellings and a factory of an early industrial fishing enterprise with imported Filipino and Malaysian fisherman is still visible which dates back to 1885 when William Walsch established it. Transport to the Cape was too cumbersome in those days which resulted in its closure. From 1912-1915 Stony Point was used as a whaling station by the Southern Cross Company when liquidated as a result of the outbreak of World War Two. Irving and Johnson operated the whaling station from 1916 to 1928 when it was finally closed. During World War Two, Stony Point was used as a radar station with soldiers sleeping in military barracks at Mooi Hawens (built in 1940) and Hangklip hotel where British servicewomen operated the radar station. Today Stony Point is best known for the first ever recorded mainland colony of the endangered African Penguins (Spheniscus demersus) with nests first noticed during 1982. The earliest residential structures were build in De Wetsbaai by the Luckhoff, Petousis and Albertyn families. The very first was a wooden structure that was blown away during a particularly heavy winter storm. Three later structures still remain of which one in Luckhoff way is a heritage graded building. Betty’s Bay was established during the thirties as an increasingly popular nature holiday destination far from the maddening crowds with endless unspoilt beaches and warmer sea water than Cape Town. It has an interesting history of farmers from the Overberg who used to trek down to Dawidskraal (a known “uitspan” site with fresh water) by ox-wagon over the Palmiet River with a pont in later years being the only access to Betty’s Bay. The heart of the village and home to the king protea (protea cynaroides) as well as the Red disa (Disa uniflora) is the famous Harold Porter National Botanical Gardens named in honour of Harold Porter, one of the three founding members of the Hangklip Beach Estate Company. He and his wife Olive moved to Betty’s Bay in 1936. Their estate “Shangri-la” was bequeathed to the then National Botanical Gardens (today known as the South African National Biodiversity Institute) of South Africa in 1958. Betty’s Bay derived its name from the daughter of one of his business partners Arthur Youlden. The scenic R44 stretch of Road from Gordons Bay which runs through Betty’s Bay is named after Porter’s other partner Jack Clarence. Then there is the Brody Link Nature Reserve between Betty’s and Pringle Bay, which was donated by the Brody family and is under the management of WWF. During 1954 the HF Verwoerd Marine Reserve was established which is still in place today. He also built a holiday home here in 1950 which still exists and is protected by the heritage Act 25 of 1999. On the way to Betty’s Bay opposite Pringle Bay on your left, you pass what once was the World War Two Italian prisoner of war camp which served as convict labour to build Trunk Road 27. The immediate vicinity around Betty’s Bay offers numerous interesting walks and stories such as the fishing accident of Dr JF Malan at Rooi Els at a place called Kruisies as well as the famous Drostersgat cave that was home to many run-away slaves until 1838 when slavery was abolished in the Cape. They were apparently still hunted down for another forty years after this. The Walsch brothers owned virtually the entire strip of coast from Rooi Els to the Palmiet river at the end of the 19th century. Military testing grounds of the G5 Canon and other missiles, a zero gravity testing facility as well as the site where Arende, a locally produced TV series on the Anglo Boer War was produced. Ruth Middleman researched and farmed with Proteas and other indigenous species at Honingklip since 1947. For architecture of note the bay offers Pius Edmund Pahl (SAIA gold medallist), the last Bauhaus architect from Germany to study under Ludwieg Mies van der Rohe among who’s associates were Le Corbusier. This house, his last building, is regarded as typical of Pahl’s own unique expression of modernism. It was constructed during 1994 and commissioned by the Van der Horst family. It is situated in Bass way opposite Malkopsvlei , also known as Bass lake. Near Main beach in Morea Road you will find another example of modern expression by the SAIA Gold medalist architect Dr Gawie Fagan. Both these houses are heritage graded and protected structures. In the middle of Betty’s Bay on the mountain side next to Clarence, you will find two stone houses with slate roofs in Arts & Crafts Style dating back to the time of the Hangklip Estate era when they marketed the bay as “Tomorrows Riviera”. There are 3046 erven of which about 1658 has been built on. Permanent households estimated at 635 with permanent residents approximately 1800. During peak season it attracts around 9500 visitors and out of town owners. With many “guarded” secrets to be discovered such as Nivenia Stokoei, and Orothamnus being among many known endangered plant species. On the beach you may well pick up Argonauta nodosa under the watchful eyes of the endangered Haematopus manguini bird. Due to its approximately eleven kilometer long lint development Betty’s Bay is stretched out which assists in maintaining a natural rural quality. Seven years on, not much has changed, thanks to the tireless efforts of environmentally conscious individuals and organizations such as Betty’s Bay Ratepayers’ Association, Kogelberg Biosphere Organization, Overstrand Conservation Foundation, Botanical Society and many more who are wanting to keep Betty’s Bay the coastal town it still is. There is no chance of getting streetlights. Hence spectacular star gazing opportunities. Major development is frowned upon and ninety five percent of streets are gravel. You will find road signs with turtles and buck encouraging you to drive slowly and give right of way to the fauna. Then there is the hacker group who spend lots of time clearing out non indigenous trees such as Rooikrans and Port Jackson. Loud noise, outside lights and domestic animals outside their yard without being under the control of the owner may cost you a five-hundred Rand fine. Numerous municipality By-laws controls among other building activity and rumbustious behaviour. It is one of the first municipalities in the country which embarked on an extensive Heritage Survey which controls many aspects of building code particularly structures older than 60 years and special management zones such as wetland and dune areas. This will guide how we may build in the various sensitive areas. We still have a long way to go towards a more sustainable lifestyle and building form with some activities starting to take shape as people become more aware. Recycling is another great success story of the Overstrand Municipality and the residents of Betty’s Bay have embraced this wonderful initiative. As for why kindred spirits are attracted to this bay, perhaps it is because they feel at home in and with nature where you will find no fences which divides as a new concept for a nature area. No wonder that UNESCO – United Nation Educational, Scientific & Cultural Organization MAB – Man and the Biosphere Programme by decision of the International Co-ordination Council of the Programme of Man and the Biosphere, The Kogelberg Biosphere Reserve has been designated for inclusion in the world network of Biosphere Reserves on the 8th July 1998.